TUSC Stoke & Staffordshire supporters stand in solidarity with PCS members and offer any support we can give to the fight to save their union from a vicious attack from the Tory government. 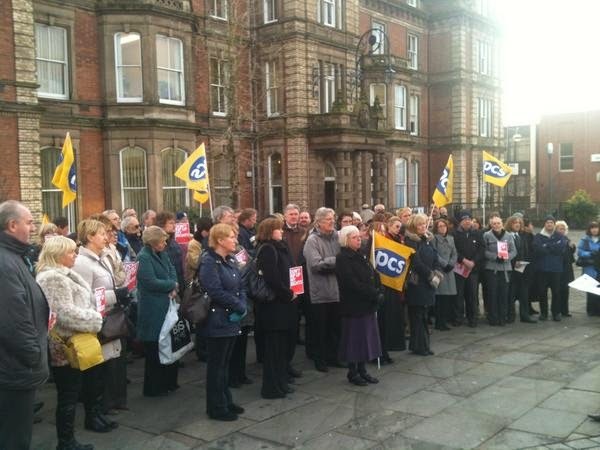 We also appeal to all other trade unionists and workers to support the fight of PCS members to defend their union. The PCS has been a thorn in the side of the Tory government and has played a crucial role in leading the fight back against their savage austerity measures. Their fight is our fight! The Tories are trying to undermine PCS as its foremost critic in the trade union movement. Our work on challenging austerity and importantly our campaign to promote an alternative, including our Tax justice campaign, have been widely supported and embarrassed the government. Our campaigning and industrial action has had some notable successes, including: winning over 1000 more jobs in the Passport Office, winning extra funding at Kew Gardens, stopping the privatisation of the Land Registry, and ensuring fixed term contracts have become permanent posts in HM Revenue & Customs. These successes, among others, were delivered by a combination of industrial action, political campaigning and media work that pressured the government into backtracking.